Following intense discussions among science partners and BirdLife Netherlands, in 2006 the outlines of a long term Global Flyway Network were established and endorsed by BirdLife. 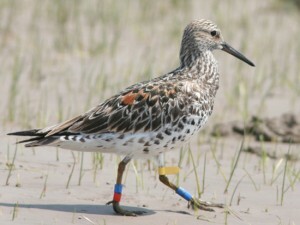 A colour banded Great Knot on the Yellow Sea. Image: © 2007 Chris Hassell. 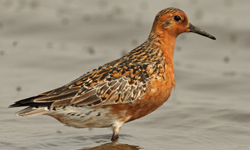 The Global Flyway Network (GFN) is a partnership between researchers worldwide who are devoted to long term — usually demographic — work on long distance migrating shorebirds. The partnership aims to build on the strengths of comparative demographic shorebird studies worldwide, with the aim to understand and analyse the factors determining shorebird numbers in a rapidly changing world. 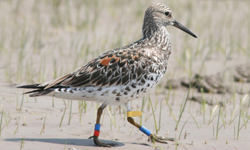 In practice it also tries to fill major gaps in coverage of fieldwork of the world’s most threatened shorebird flyways. Shorebird populations worldwide are declining and their habitats are under stress from human factors including global climate change. 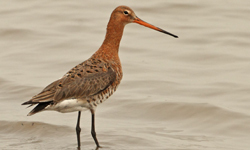 To underpin the conservation of the migratory shorebirds that connect us all, GFN aims to foster and conduct global cooperative ecological and demographic research. 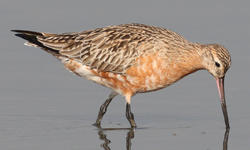 Initially our efforts will focus on flagship species such as the Red Knot, Great Knot, Bar-tailed Godwit and Black-tailed Godwit.